In order to improve the technological process of potato harvester during operation in hard soil-climatic condition, vibratory digger shovel was created and mounted on exiting potato harvester produced by Grimme (RL 1700), Further laboratory and field experiments. Theoretically established mutual dependence between technology and design parameters of the vibratory digger shovel of potato harvester. Optimization of the parameters have been occurred by processing of the influencing factors using the theory of Similarity and dimensions. The existing drills and working bodies to separate seed and fertilizer do not fully ensure the implementation of agro-technical requirements for the zone of Northern Kazakhstan. Therefore, the creation of stubble sowing and fertilizers with a separate seed and fertilizer is a major challenge. The novelty of the proposed seeder is that the implementation of the separate seed and fertilizer at planting is done at the expense of modernization and seed boxes are sealed parts. The formulation and fertilizers stubble seeder with a separate seed and fertilizer put the scheme tested in different soil-climatic zones of the CIS-planters cultivators type ESS, namely SZTS 2.0 while performing presowing loosening the soil, seeding, and ferti-lizers introduction and after sowing compacting. The program and methods of field research combine harvester equipped with a system of low-frequency electromagnetic radiation grain material; specification for the design of combine radiators with the system in different locations in the course of promoting the grain of the material from the hopper to the ISU. Rice harvesting became recently a problem due to shortage of labor and, consequently, the increase of wages in Turkey. The aim of the study was the determination of relationship of combine harvester age and the grain losses during on paddy harvest. This study was conducted at the paddy production field planted with Karacadağ variety in Çınar District of Diyarbakır Province in 2013. The New Holland Combines which has same brand but different ages in series of 2002 model TC 56, 2006 model TC 56, 2007 model TC 56 and 2013 model TC 5070 were used in the field experiments. The header losses, which include shatter losses and cutter bar losses, threshing and separation losses, and cleaning losses were measured in the study. The total of these losses was evaluated as combine loss. According to the results, the harvest loss due to combine changed between 6.67% to 9.23%. The lowest harvesting loss was obtained in 2013 model TC 5070 combine series. This was followed by 2002 model TC 56 with 7.32% loss. This results show that the harvesting loss was not directly depended on combine age, it was affected by the factors such as combine adjustment and maintenance, operator skill, product yield, field conditions. The development and implementation of repair and servicing work during the period when the equipment with regular use is in a state of readiness for use is one of the areas to ensure a high level of reliability of the machines. 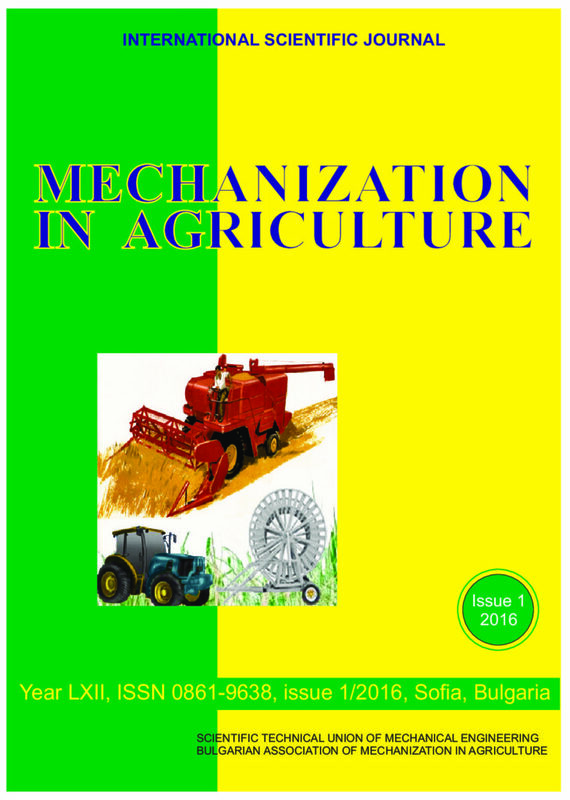 A mathematical model is developed to optimize the frequency of prophylactic effects of complex systems with periodic use of the type of self- propelled harvesting equipment in agriculture. The influence of the main parameters of the model on the optimal frequency of preventive effects and are edified y numerical values for combine harvesters’ series "SK-5" and "Don 1500". Irrigated agriculture has brought mechanization applications and thus has increased cotton production area, yield and production quantity in Southeastern part of Turkey. This increase has led to the development of ginning industry in the region. Also it has become important to standardization the cotton ginning and baling. In this study, were investigated and evaluated current situation of the ginning factories in Diyarbakir province. The study was conducted by applying the survey methods to the visited factories. In the survey, respondents were asked questions regarding general information about the factory, current situation, capacity, raw material procurement, marketing, sales and general problems. In study, 50 factories were investigated, which were registered to Diyarbakir Chamber of Trade and Industry. The results obtained from the study show that the 17 factories have closed for several reasons. In particular, it was found that ginning factories do not operate efficiently with regard to the labour force employed and the amount of capital invested. In addition, it was determined what processed and baled cotton sold out of the province of Diyarbakir. Also, it was determined that factories had difficulties working low capacity, were between 60-120 days of annual working time, lack of qualified employee, financial difficulties, couldn’t find quality cotton, insufficient agricultural supports and unstable pricing policies. A model of a machine operation with account for systematically important factors has been proposed. It is dealt with practical methods for quality assessment of agricultural machinery and its technological processes. The obtained results afford evaluation of the Forage Shredder technological reliability during its operation as component of a flow line. Developed structure and proposed qualifications of the properties and performance of the quality and reliability of machinates. Ssuggested new classification of numerical and functional characteristics of indicators of quality and reliability of production. The main issues considered in this topic are: Regional sistems for monitoring and analysis of agricultural indusrty; The structure of databases and perspectives of technological developmen marketing sistem „Agromonitor“. This paper presents results of shoot culture of in vitro microtuberisation of potato. Were researched induction of callus and roots of shoot explants on seed varieties of potatoes like: Dido and Marabel and mercantile varieties of potatoes like: Agria BE and Agria SR.
During this research the initial explants – sprouts, further are transfer (passeges) to new nutrirent medium, fresh, with new hormonal composition. These explants transferred to the new fresh medium are called shoots.